Pros Its unique premium rubber material makes it a top choice for slip prevention and provides added durability in tougher sessions. Cons There is a strong initial chemical/rubber smell -- it often vanishes with several uses. 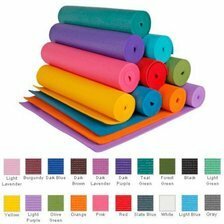 Summary The best yoga mat available. More expensive than other mats, but its cushioning and performance makes it worth the extra cost. 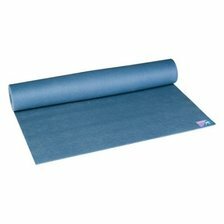 Pros Its textured non-slip surface makes this mat a must-have for beginners seeking excellent traction. Summary Various color and style options catch the eye, but it doesn't hold up as well over time as some of the other mats on the market. 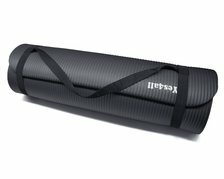 Black NPR Yoga Mat 68x24x1/2"
Pros Thicker cushioning and higher density material -- ideal for impact absorption and balance -- separates this mat from competitors. 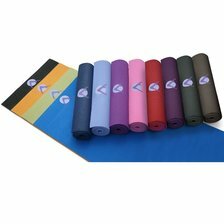 Cons Several customers complain that this mat wears too quickly and lacks sufficient grip. Summary An attractive price tag lures budget-conscious consumers, but the mat wears out faster than its slightly pricier counterparts and has a more slippery surface. Pros Customers rave over this mat's plush cushioning and the fact that it comes in multiple sizes. Cons Not sticky enough when you are perspiring heavily. 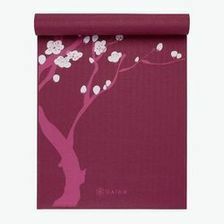 Summary A decent yoga mat, but the Aurorae and Jade offer a higher level of cushioning and comfort. Pros A best bet for cushioning joints and knees thanks to a durable 1/4-inch thickness. Cons Can get slippery, especially during tougher sessions. Summary Extremely durable. Offers ample length, grip, and cushioning. Perfect for both beginners and more advanced users. The best value for your money.